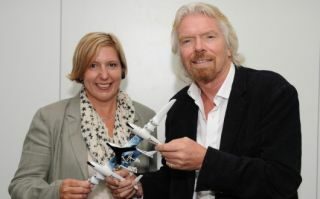 Space tourist Marsha Waters is pictured here with Sir Richard Branson, founder of Virgin Galactic. On the heels of the 50th anniversary of the first woman in space, Virgin Galactic announced today (June 17) that it has booked a female space tourist from the United Kingdom as its 600th customer. Virgin Galactic officials said Marsha Waters, the 42-year-old owner of a Blackpool-based accounting services company, embodies the next generation of women in space: "private individuals who are passionate about experiencing space travel for themselves." Of the space tourists who have so far signed up for a suborbital flight on SpaceShipTwo, 98 are women, a spokesperson said. That list includes actress Angelina Jolie and pop singer Katy Perry. "I've always been fascinated with space and often wondered whether space travel would ever be a possibility for people like me, especially in my lifetime," Waters said in a statement. "After watching Virgin Galactic's supersonic test flight at the end of April, I thought 'this is it' and made the decision to purchase my ticket to space while I still had the chance. It's a big step and a major financial commitment for me, but I know it will be the most exciting, worthwhile adventure I will ever embark upon." A seat aboard the six-passenger SpaceShipTwo costs $250,000, but the space plane is still in its testing phase, with crewed flights expected to begin by the end of this year. SpaceShipTwo is not slated to make full trips around the planet; rather it will fly to suborbital space and back, offering its passengers the experience of weightlessness for several minutes and a rare view of Earth's limb against a black sky. Sir Richard Branson, the billionaire founder of Virgin Galactic, wrote in a blog post that he recently met Waters in London and "can't wait for her to experience space travel for herself." Branson noted that the announcement comes between two big anniversaries for spaceflying females. Fifty years ago Sunday (June 16), cosmonaut Valentina Tereshkova became the first woman in space during the Soviet Union's Vostok 6 mission. Thirty years ago Tuesday (June 18), Sally Ride became the first American woman to go to space during a flight aboard the Challenger space shuttle. Ride, who died of pancreatic cancer in 2012, will be awarded a posthumous Medal of Freedom by President Barack Obama later this year.